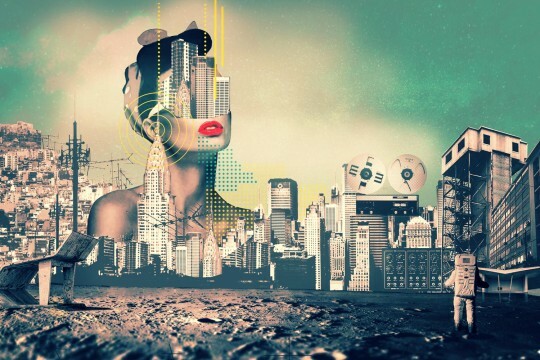 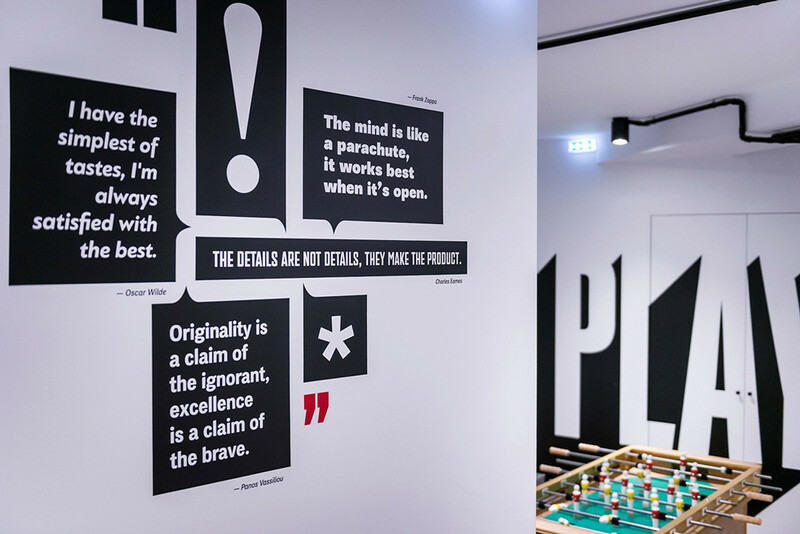 Typeroom® is a creative hub dedicated to and inspired by typography and the graphic arts. 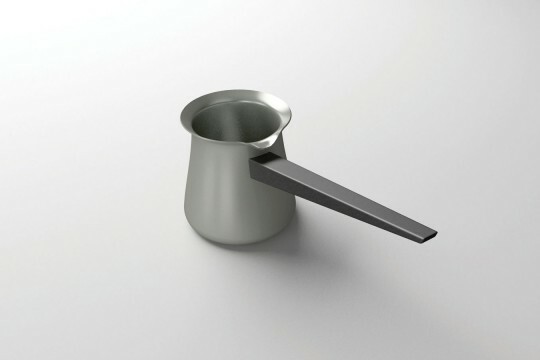 Recently relocated in the historic centre of Athens. 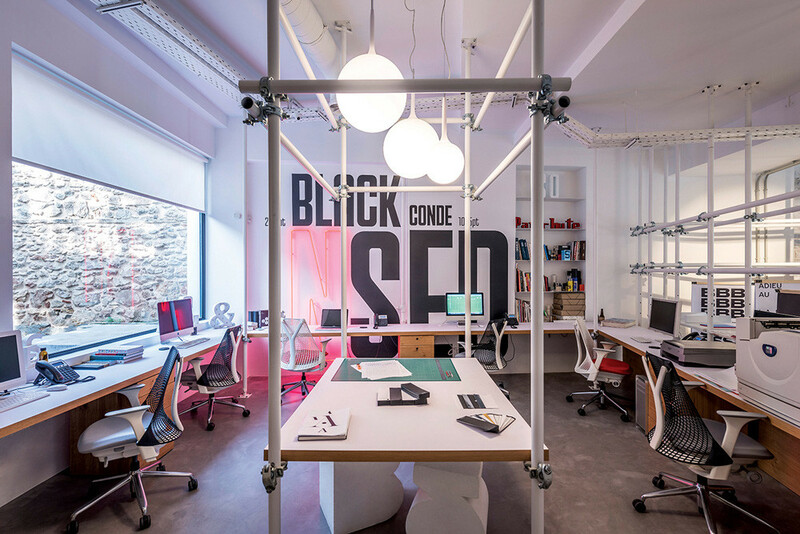 Typeroom® is a 250 square meter space with an industrial feel; a room full of letters that features large scale applications of type throughout. 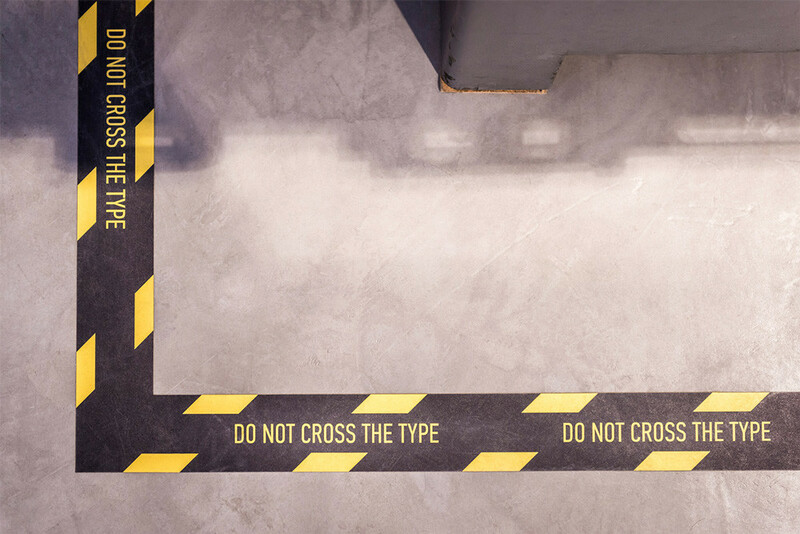 With the aim of highlighting the powerful dynamic of type, letterforms, ligatures and various characters have been employed in the construction of typographic elements whose purpose extends beyond their decorative nature. 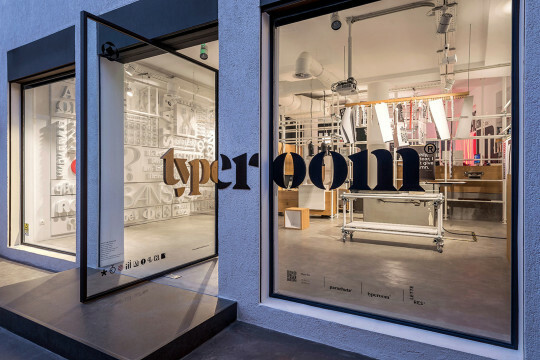 Typeroom’s design process revolves around the idea that large scale environmental applications of type can fulfill both practical and functional purposes: Typeroom® elevates letterforms and the art of typography into physical objects that people can touch and interact with. 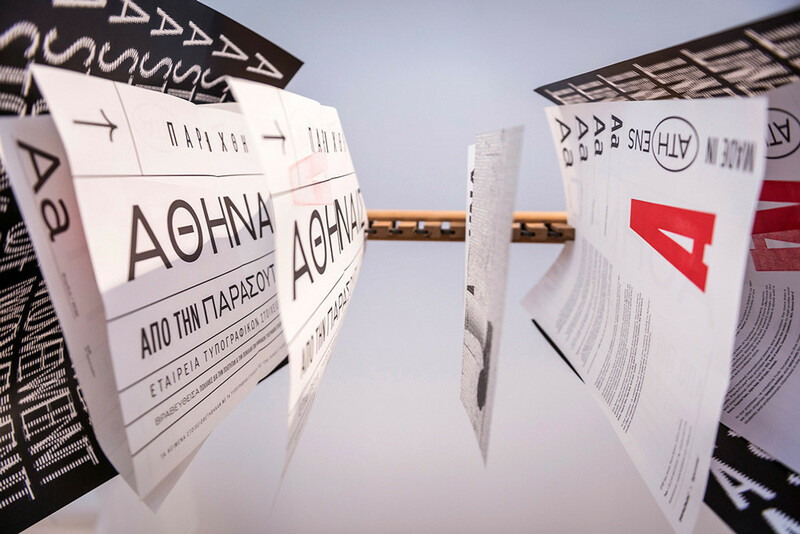 Acting as a reference point for creatives in an urban setting, Typeroom’s 30 square meter exterior reflects the city’s identity in a typographic manner with a graffiti that reads ‘ATH’ -short for Athens- while a large-scale alpha made out of metal sheet pays homage to the Athenian spatial context. 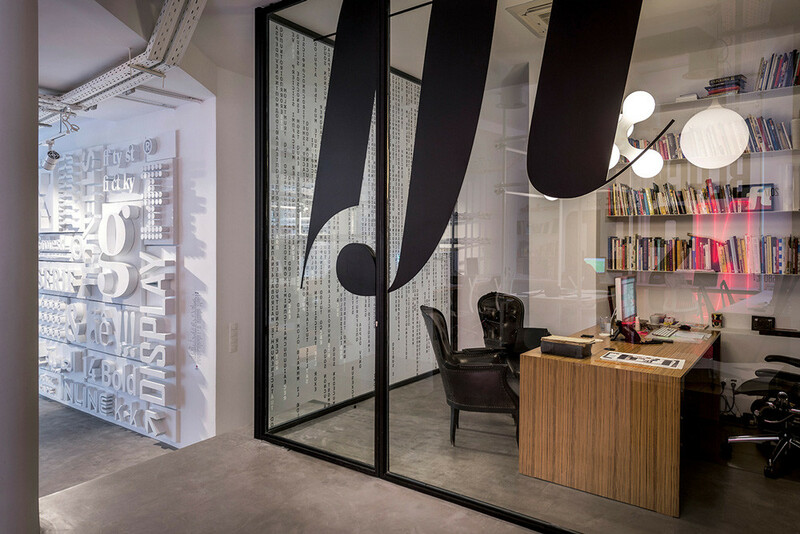 Upon arrival, visitors encounter and come in direct contact with physical applications of type, as they push the wooden letter ‘e’ in the signage that adorns the building’s glass façade in order to enter the space. 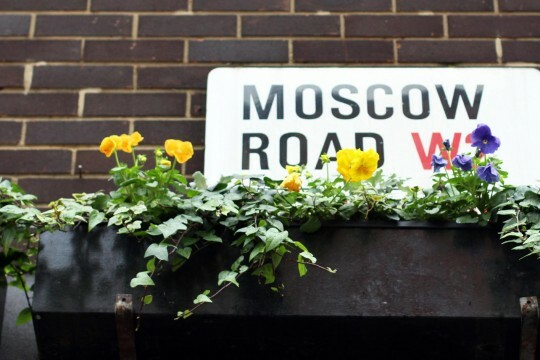 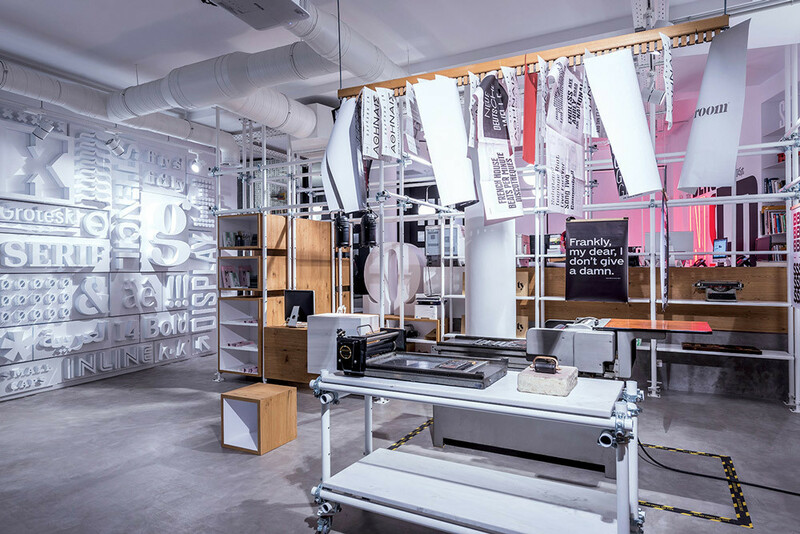 The materials used on the signage are oak wood and metal, both of which can be found in the space’s interior design, therefore giving a sense of continuity between the exterior and the interior. 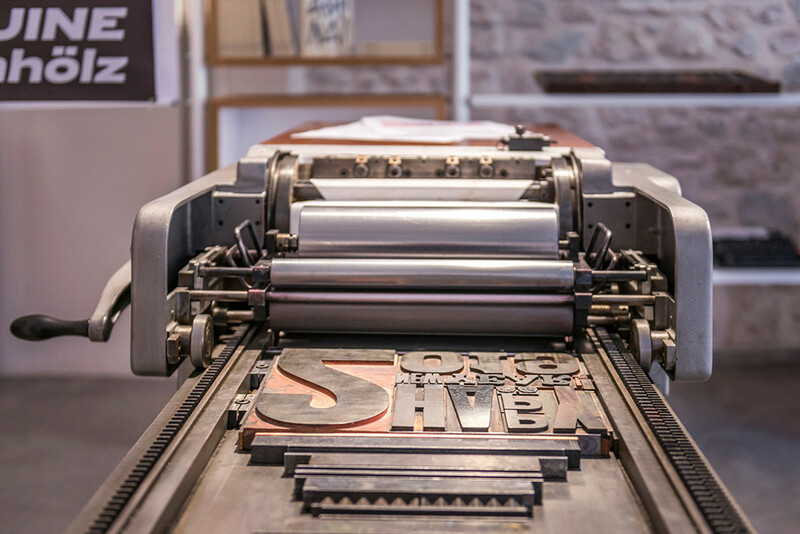 This feeling of coherence is also amplified by the act of touching a wooden typographic element to ultimately enter a room full of letters. 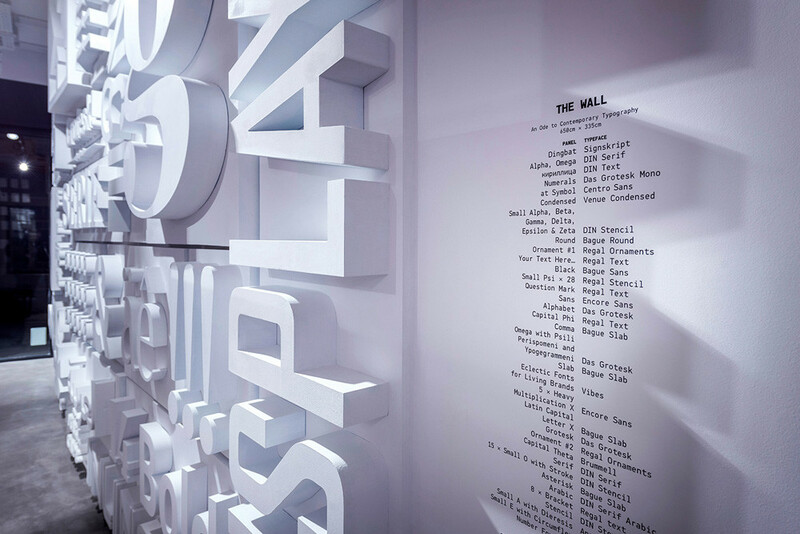 As they enter Typeroom®, visitors are greeted by the imposing Wall of Type, an ode to contemporary typography that stretches 650cm x 335cm and displays 22 of Parachute Typefoundry’s typefaces in 3D against a white background, giving the impression that letters are literally jumping out of the wall. 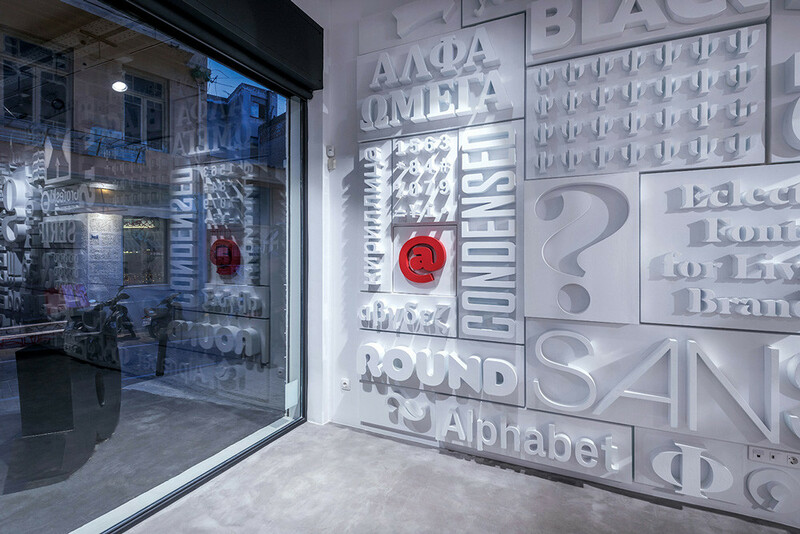 Furthermore, letterforms and typographic elements with a practical purpose can be found all around Typeroom®: a large capital Greek Omega is used as a space separator between the showroom space and the office space, while a Greek letter delta as well as a beta have been turned into sitting stools. 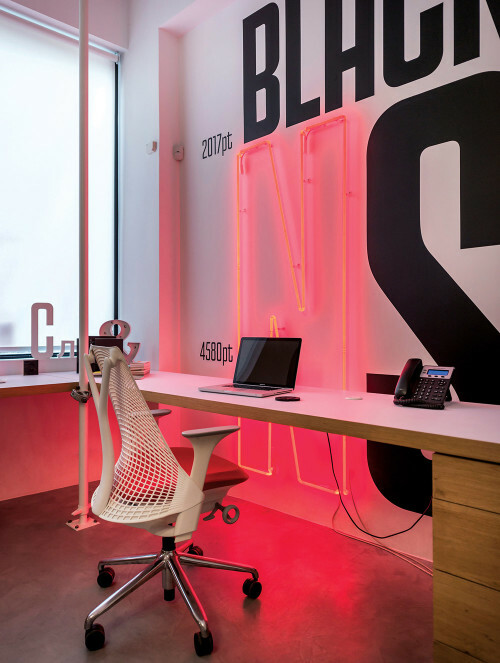 Wanting to illuminate and explore varied applications of environmental typography through the use of diverse materials, a neon installation that takes the shape of letter ‘N’ has been implemented on the wall facing the office area, emitting a warm red glow that lights up the office after dark and adds to the contemporary and industrial aura of the space. 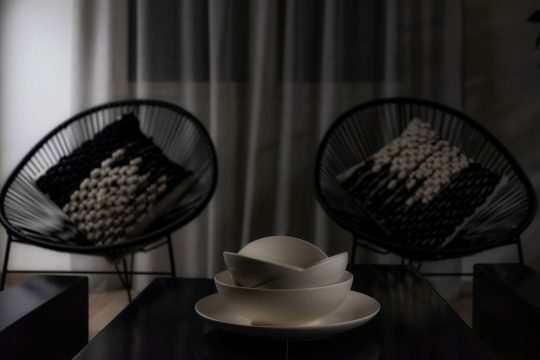 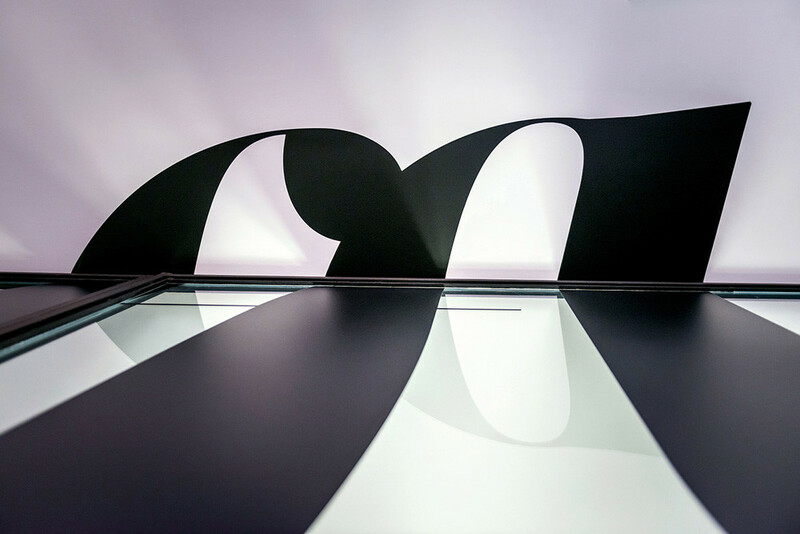 This light installation is part of a large-scale typographic synthesis that reads ‘BLACK CONDENSED’, a clear reference to the corresponding font weight which belongs to the PF Venue type family. 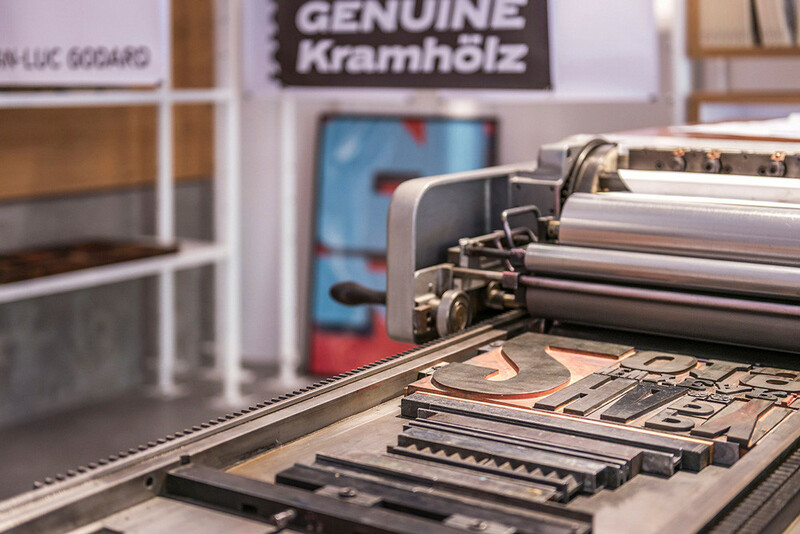 In true typesetting fashion, this typographic synthesis has been designed and set in sizes larger than 1000 points. 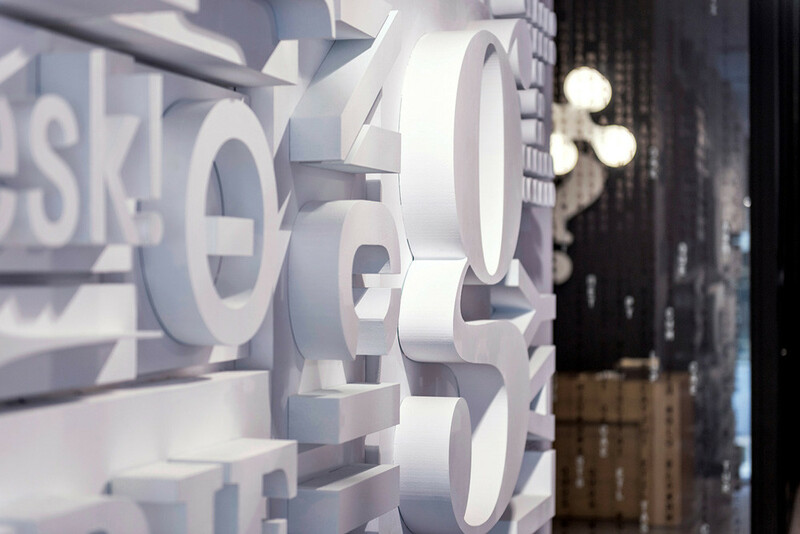 The number of points -the official typographic unit used for measuring font size- is mentioned on the wall to accentuate the size of the letterforms. 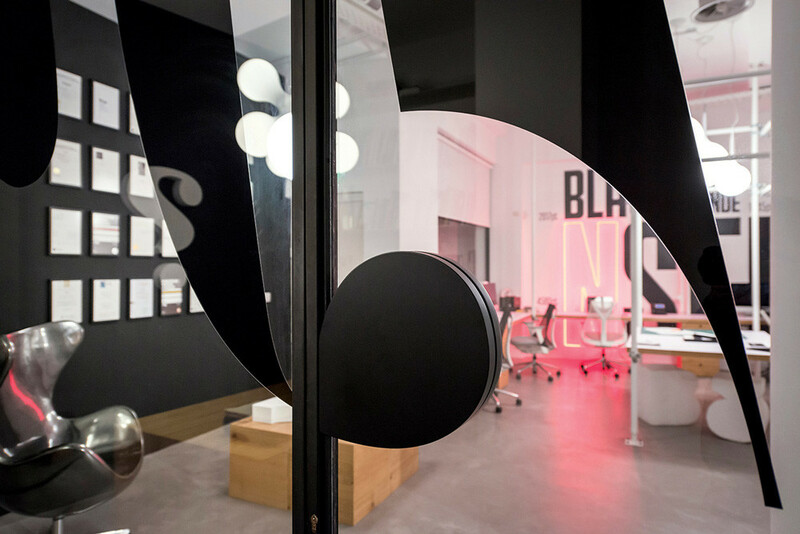 Similarly, a large-scale ‘f f l’ ligature of PF Regal Pro (Parachute’s multi award-winning typeface) with sharp curves that stretches from floor to ceiling has been implemented as a decorative feature on one of the office doors. 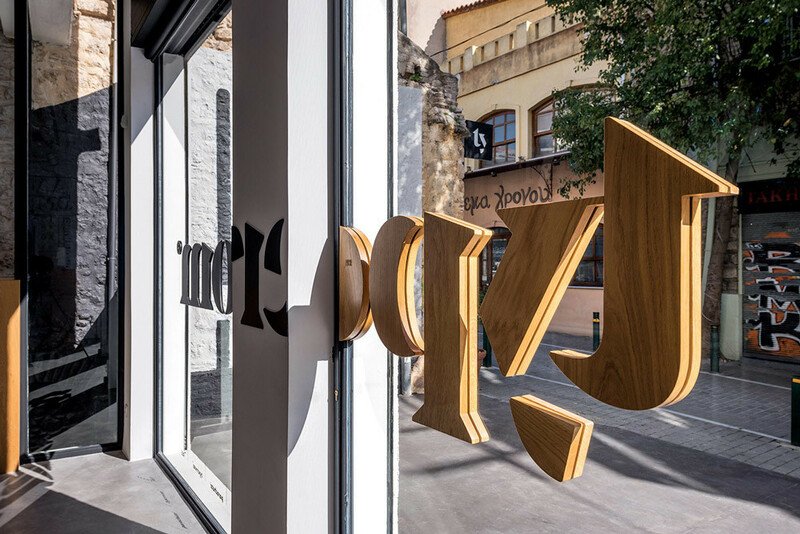 It has been placed in a way that its ending also functions as a door handle made of solid wood, inviting visitors and clients to touch it, thus engaging and interacting with applied typography in the physical realm. 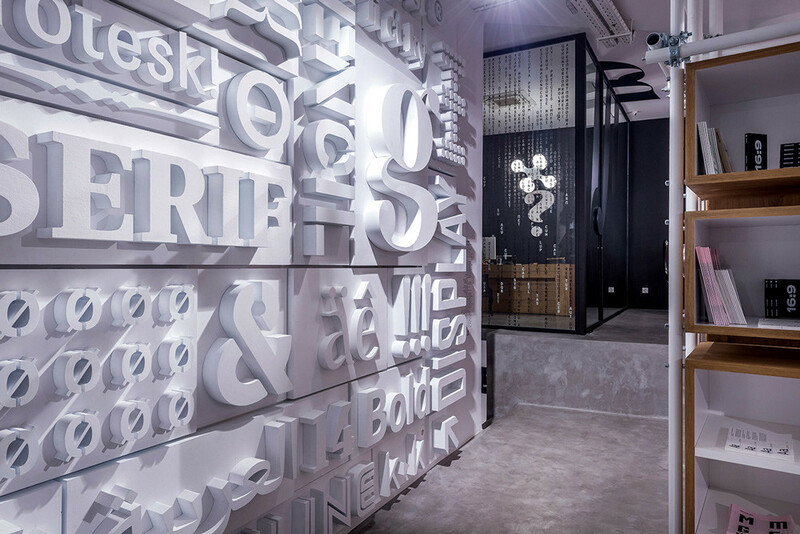 Due to its substantial thickness and weight, this typographic door handle further emphasizes the three-dimensional properties of type. 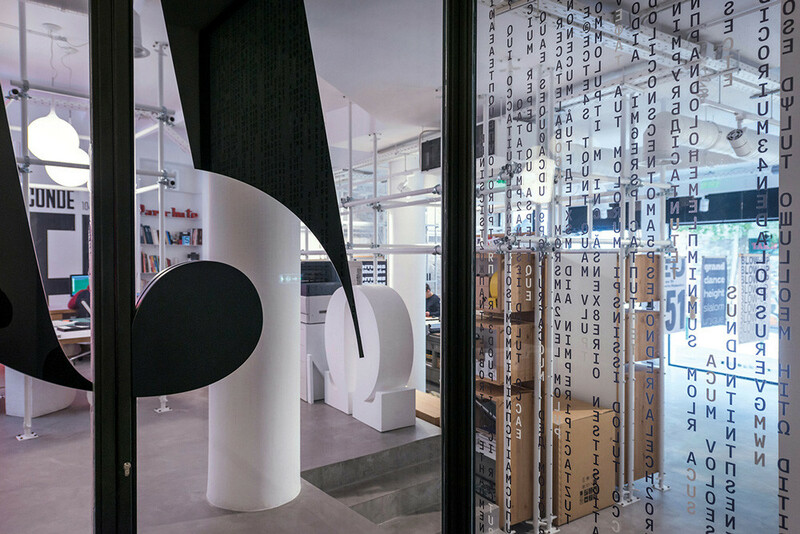 Furthermore, a matrix-like rain of typographic elements has been applied to one of the office windows, referencing digital letterforms and type design. 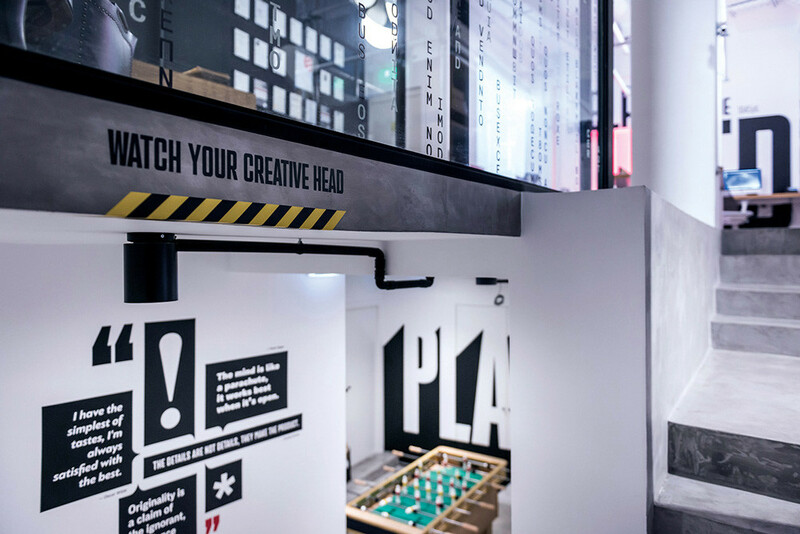 As one begins to descend into the lower level of the space, a sign that reads ‘WATCH YOUR CREATIVE HEAD’ warns people of the lower height of the staircase. 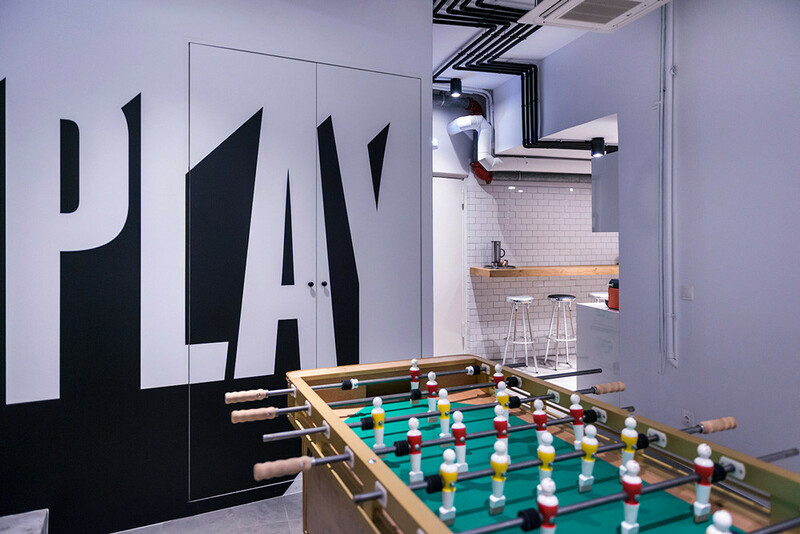 A playroom can be found in the lower level, which includes a foosball table and a storage cabinet that reads ‘PLAY’. 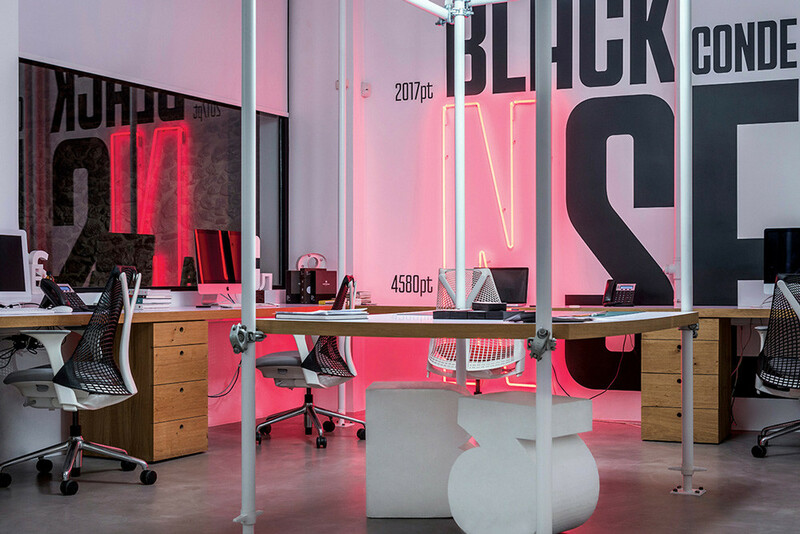 Set in large and bold type, it acts as signage that defines and welcomes us to an area that’s meant to have a fun and lighter feel. 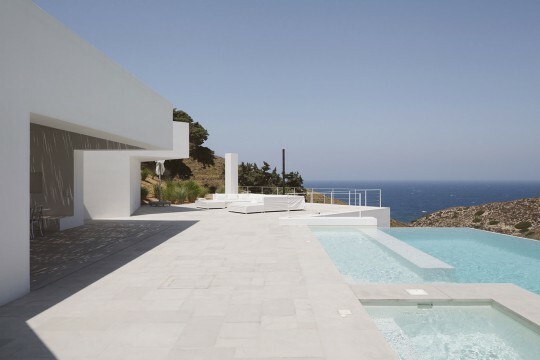 The bathroom area is located on the same level. 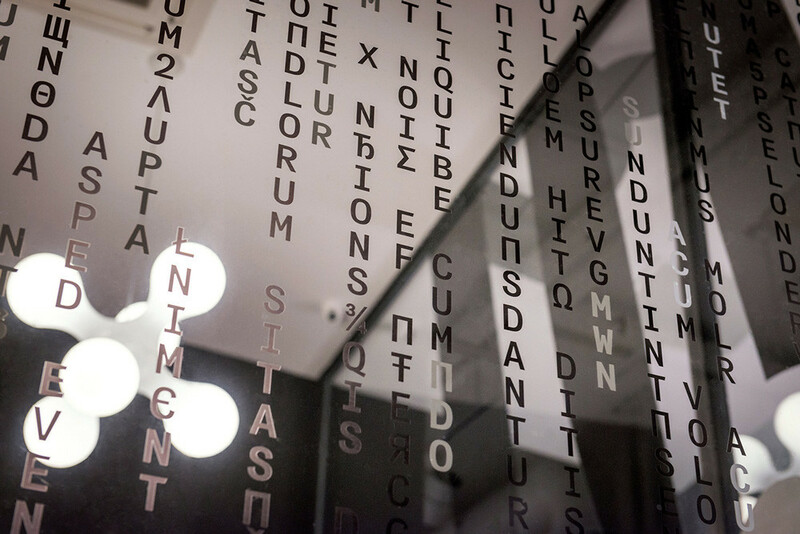 With blown up, striking type used in place of bathroom signs, each door announces the gender in multiple languages, referencing Parachute® Typefoundry’s multi-script typefaces. 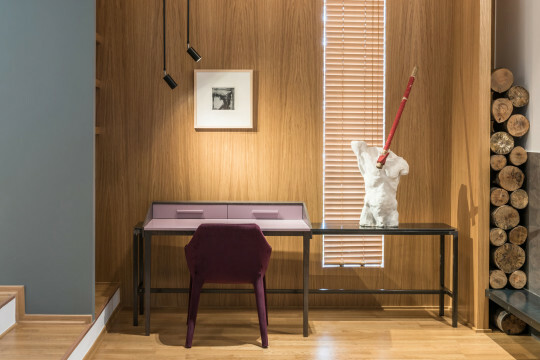 Typeroom® is located in the neighborhood of Psyrri, right at the heart of the Athenian centre. 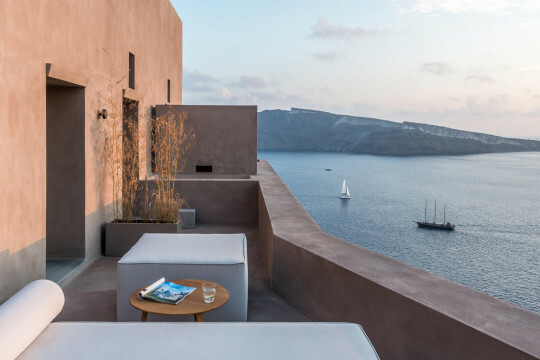 One of the oldest and busiest quarters of the city, Psyrri is brimming with culture and creativity, its surrounding streets filled with artist studios and small indie shops. 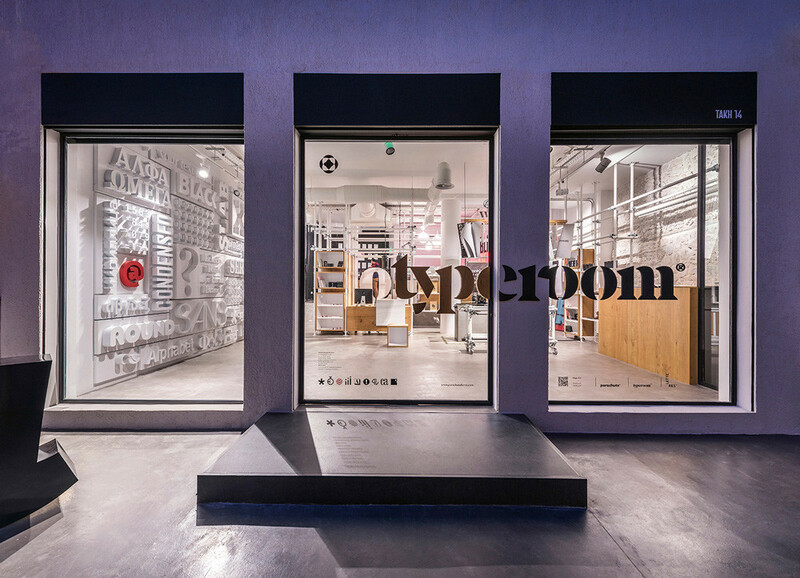 The choice of location for Typeroom® was a direct result of the need and desire to engage in dialogue with other designers, creatives and cultural figures, while welcoming anyone that wishes to discover and interact with the art of type.